Who or what is this Pizza Goat everyone is talking about? It’s a goat that was spotted eating pizza with a couple of humans at Famous Famiglia at 50th St. and Broadway around 11 p.m. last night. Why was it doing that? What did the employees think of this? “I don’t know who let the goats in because we normally don’t even let dogs in,” one of them told DNA Info. 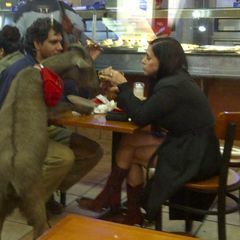 Are Pizza Goats the hot new pets of 2012? Is Pizza Goat the most unsavory guest in the history of this particular Famous Famiglia?